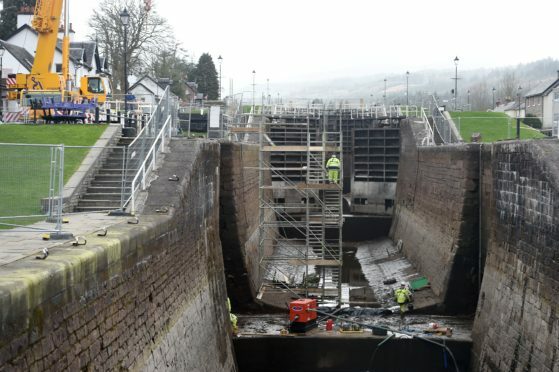 Works worth in the region of £5.3million on prominent locks along the Caledonian Canal are nearing completion, with engineers planning to reopen the route to boat traffic this Wednesday. The 60-mile canal, created almost 200 years ago, has been closed while lock chambers were drained at Fort Augustus and nearby Kytra and Cullochy to allow for a refurbishment. They were due to reopen on April 8, but that was pushed back due to “unexpected issues”, with the canal now expected to re-open to boat traffic on Wednesday. Scottish Canals has apologised for the delay, saying engineers faced challenges installing modern gates into the historic walls. Local businesses that rely on the canal for trade said they were “disappointed” by the delay but understood both the need for the works and their complexity. Audrey Hogan of Caley Cruisers, which leases out 28 boats, said at the time of the announced delay: “Obviously we have lost bookings, which is disappointing. “But our view is the repairs need to be carried out to ensure the locks are fit for use for the future, so we can continue to use the canal for years to come. Engineers have been working seven days a week in order to bring the work as close to its original scheduled opening date as possible but admitted they had been unable to claw any time back. The reopening will take place around 8.30am on Wednesday.